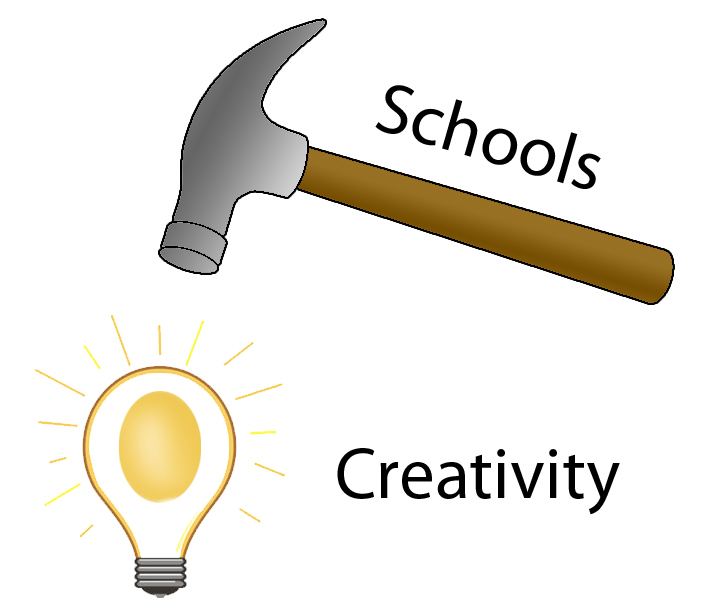 Does Formal Education at School Today Kill Creativity? Education, this is something that runs in each of our minds as a student, as a parent, as a teacher who is a parent and as a teacher. Why specifically mentioned as a teacher who is a parent deliberates that they are knotted in both ends and they have the complete insight of the expectations of the parents and the reality deliveries at schools. Many prominent educationalist and writers mentions clearly and have spoken much over the creativity in children and one such mention was that, ‘children have extraordinary creativity and are born with the creative talents and over the education they unlearn their creativity skills.’ It’s a sad thing and that is exactly what is happening in the current day education system. Well, passionately let us consider creativity coming along with us as we grow up. Yes! It must as each of us are born creative and we grow killing it at every stage. The slaughterer here what I wish to call is the competition and the comparison. We all know parents who are not aware of the education, the concepts, the chapters and the knowledge which the school provide to their child, but even such parents are a double degree professionals in knowing the competition and studying the comparison. All the creative dilution starts here and as parents expect their children to stand in the cut-throat competition the pressure mounts up on students and they are seen snatched away from their hobbies, sports, interest and the creativity. This over the period keeps them much away from the creative stuffs and makes them run behind the unrealistic competition and the numeric scores. So, how are we going to grow up creativity, well let’s come to it. In the recent times end of the academic year one common activity syndrome is seen among the parents, what I call it is ‘Shopping for School’, am sure most of you would agree to me as the academic year draws to end the parents meet to plan and explore rather exploit with schools. This should be to the attention of parents and teachers, creativity is directly the so-called intelligence which can be experienced in the subjects they learn. Brilliance comes when the child can grasp the lessons taught, the lectures listened, the books read and able to reproduce the learnt content during the exams and assessments. But what intelligence meant is that the blur line between the learning and thinking. When the child learns the subject in different modes and when he must reproduce he thinks his ability to add his original ideas which are said to have more value and this outcome is much welcomed. Thankfully, creativity is related to the academic excellence too and wonder not that those who enhance their creative capabilities with the excellence in human imagination are the genius the world celebrates. Hooking on to the mundane system losing energy over winning the competition may be the part of today education but how many of the students are encouraged to work on their best and the rest to concentrate on their passion, creativity and experimented. When I mention experiment it calls for more thoughts. Fear of experimenting, kills creativity! Another reason how the education kills creativity is that children of today fear to do mistakes while mistakes when done opens the creative door. They fear to be wrong and as they set their minds that to be wrong is not acceptable they condense their thinking capacity and initiate bring experimental as their mind thinks. This is because mistakes when done are subjected to humiliation and demotivation. So, as the child grows up without mistakes they lose the capacity of creativity. Somehow today’s education is killing the creative capacities in students. In the popular talk of Sir Ken Robinson clearly indicates the education that kills the creativity and restoring it with complete awareness to the parents and teachers of this generation. Schools should consider the intelligence in students and encourage. Not just the exams and scores should determine the academic excellence. The competency should be measured on the creative part and educating the children of today with the different competency and free thinking ability makes the school responsible for their success and would be creating successful future leaders. Thank you sharing this information. Interesting to know this type of formal knowledge. I know a group of students https://typicalstudent.org/ It will help them.